A new campaign aimed at stopping pubs being converted into shops and supermarkets has been launched by a regional daily. The Press, York, is calling on the government to close a planning loophole that means at present companies hoping to take over pubs and turn them into convenience stores, bookmakers or estate agents do not have to apply for planning permission to do so. After hearing three pubs in the city could be transformed into small supermarkets, the Newsquest-owned title’s Be Vocal For Your Local campaign was launched to give readers a voice on the future of their favourite drinking holes. The push is also calling on the City of York Council to place legal protection on all of its pubs and force free debate on every proposed conversion until the law is changed. 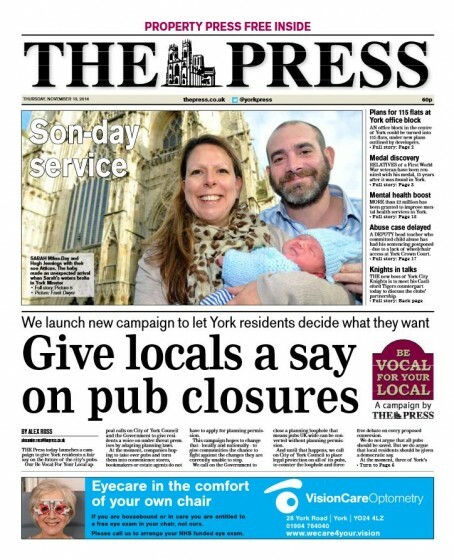 Senior reporter Alex Ross, who is leading the campaign with news editor Gavin Aitchison, said: “We started this campaign after hearing three pubs in York could be turned into small supermarkets without locals being given a chance speak out. “We want the council to protect pubs in York and the government to change the law to give those who use pubs a democratic say on whether their pubs should be kept. I thought pubs were closing because of changing social behaviour, the availability of cheaper alternatives for their services, a business landscape skewed towards a duopoly of large, over-leveraged, faceless companies serving their shareholders and the banks, and amended planning rules that saw their premises easily changed into supermarkets and betting shops. What has that got to do with newspapers in 2014? Why can’t newspaper offices be based in pubs? Long ago I knew a fine reporter on an evening paper who was essentially based in a public bar and still filed plenty of copy. No waiting for e mails every day. This is a good campaign on a sound point of principle. Why should developers/firms be able to change the use of a commercial building without applying for planning permission? Homeowners have to apply for such permission for minor works so why should big business be able to circumvent this? Pubs are, after all, part of our heritage – unlike most supermarkets!